Polymer microparticle generation is a microfluidic applications which is widely applied across many industrial fields. The variety of available polymers -each with distinct properties- are exploited for different applications. For example, PLGA or poly(lactic-co-glycolic acid) is an polymer used for targeted drug delivery device production and controlled release treatments, due to its biodegradability and biocompatibility. It is crucially important to control particle size, shape and structure for the majority of applications. Compared to traditional batch methods, microfluidics can offer users full control over the production process, enabling precise targeting of particle morphology. Emulsion droplet size (and consequently polymer particle size) can impact how flavors and aromas are released from emulsions such as hot chocolate and mayonnaise. Size also impacts the speed at which drugs or agrochemicals are delivered and released, and the length of time needed between treatments. 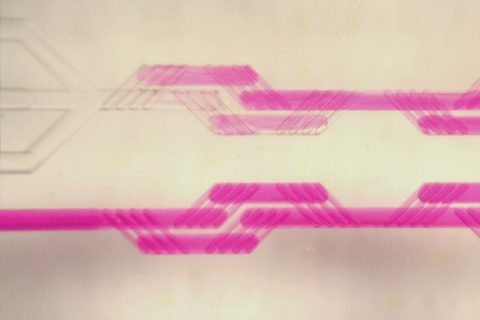 Emerging microfluidic techniques have been developed to incorporate and manufacture synthetic and natural polymers. While conventional emulsion-based methods of manufacturing polymer particles produce beads with a wide range of diameters (and thus properties), droplet based microfluidic methods can generate highly monodisperse particles in a single step, which increases the yield of the process and refines particle properties. Microfluidic droplet production methods for polymer microparticle generation include emulsifying polymers in solvent, or using the monomer mix followed by a curing process for precise particle formation. Both of these approaches can be achieved using either single channel droplet microfluidics (1) or a micromixing methodology (2). 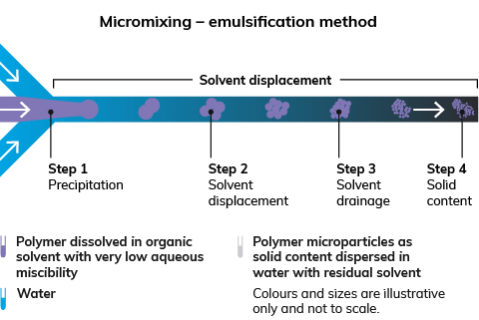 For the production of polymer particles using the polymer emulsification method, a volatile solvent that is partly miscible with water is used (e.g. DCM) to dissolve the polymer and form droplets. Once the droplets containing the polymer have been produced, the final step of this method is the evaporation stage. The solvent diffuses from the droplet, resulting in concentration of the polymer followed by particle hardening and reduction in diameter down to a precise size. The monomer mix methodology uses liquid monomers to comprise the droplet phase, and after production the polymerisation reaction can be started via a range of methods, such as thermal, photo, or chemical initiation. The hardness of the final particle can be adjusted by adding cross-linkers. Microfluidic droplet generation methods allow seamless control of the size of the particle by varying the flow rates of carrier and droplet phases, as well as changing the concentration of the polymer in the droplet phase. This method offers more precise control over droplet (and subsequently particle) size. The micromixing methodology uses a herring-bone pattern in the microfluidic channel to repeatedly shear the two immiscible fluids being used, forming an emulsion. This methodology produces a slightly broader size distribution, but has the advantage of much higher throughput. Methodology for generation of monodisperse PLGA microparticles in sizes ranging from 20 µm to 50 µm using microfluidic droplet method. Want to know more about polymer microparticles?